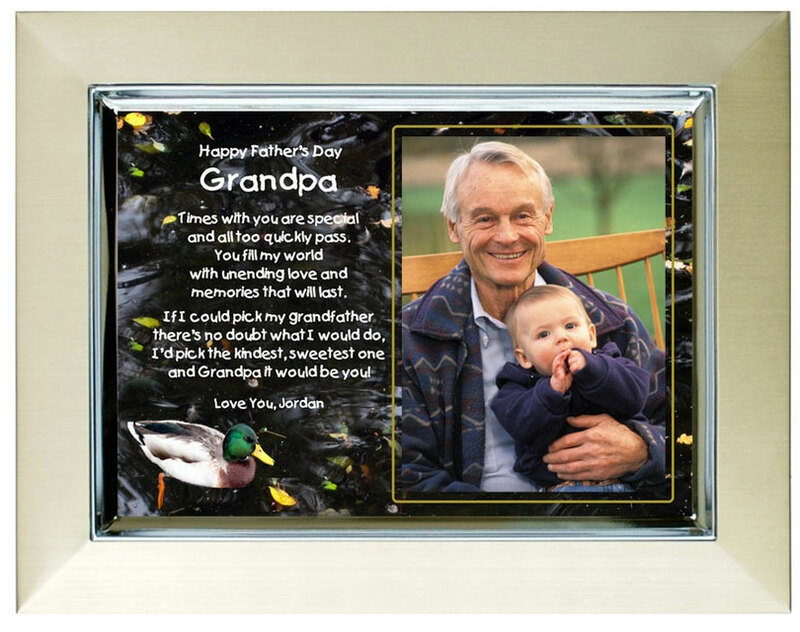 Personalize this touching poem for Grandpa with names, closing phrase and photo. The poem is presented in a cute duck design in a gold metallic frame with room for a photo. Makes a lovely personalized gift for grandfather. 1. Phrase Above Name- Examples: I Love You; Happy Father's Day; etc. 3. Closing Phrase & Name(s) as seen after poem - Examples: With Love, Johnny; We Love You, Scarlett & James; etc. and all too quickly pass. and Grandpa it would be you! The personalized poem comes in a 5" x 7" gold metallic frame with a small silver border surrounding the poem insert. There is an opening for a 3" x 4" cut-out photo area - photo can easily be inserted at any time after delivery. The frame has a stand-up easel back or it can also be hung on a wall. There is no need to send us a photo. You or the gift recipient can easily add a photo after the Poetry Gift arrives. The photo should be positioned in back of the opening. You have the option of attaching a photo before you give the person the gift or the person receiving the gift can easily add a photo. The cut-out photo opening is 3 x 4 inches. My dad takes my son to feed the ducks so this will be a perfect Father's Day gift. Thanks!